My earliest recollections are connected with Kensington Palace, where I can remember crawling on a yellow carpet spread out for that purpose—and being told that if I cried and was naughty my ‘Uncle Sussex’ would hear me and punish me, for which reason I always screamed when I saw him! I had a great horror of Bishops on account of their wigs and aprons, but recollect this being partially got over in the case of the then Bishop of Salisbury (Dr Fisher, great-uncle to Mr Fisher, Private Secretary to the Prince of Wales), by his kneeling down and letting me play with his badge of Chancellor of the Order of the Garter. With another Bishop, however, the persuasion of showing him my ‘pretty shoes’ was of no use. I used to ride a donkey given me by my Uncle, the Duke of York, who was very kind to me. I remember him well—tall, rather large, very kind but extremely shy. He always gave me beautiful presents. The last time I saw him was at Mr Greenwood’s house, where D. Carlos lived at one time,—when he was already very ill,—and he had Punch and Judy in the garden for me. I was brought up very simply—never had a room to myself till I was nearly grown up—always slept in my Mother’s room till I came to the Throne. At Claremont, and in the small houses at the bathing-places, I sat and took my lessons in my Governess’s bedroom. I was not fond of learning as a little child—and baffled every attempt to teach me my letters up to 5 years old—when I consented to learn them by their being written down before me. I remember going to Carlton House, when George IV. lived there, as quite a little child before a dinner the King gave. The Duchess of Cambridge and my 2 cousins, George and Augusta, were there. My Aunt, the Queen of Würtemberg (Princess Royal), came over, in the year ’26, I think, and I recollect perfectly well seeing her drive through the Park in the King’s carriage with red liveries and 4 horses, in a Cap and evening dress,—my Aunt, her sister Princess Augusta, sitting opposite to her, also in evening attire, having dined early with the Duke of Sussex at Kensington. She had adopted all the German fashions and spoke broken English—and had not been in England for many many years. She was very kind and good-humoured but very large and unwieldy. She lived at St James’s and had a number of Germans with her. None of the Royal Family or general visitors lived at the Royal Lodge, but only the Conyngham family; all the rest at Cumberland Lodge. Lady Maria Conyngham (now dead, first wife to Lord Athlumney, daughter of Lord Conyngham), then quite young, and Lord Graves (brother-in-law to Lord Anglesey and who afterwards shot himself on account of his wife’s conduct, who was a Lady of the Bedchamber), were desired to take me a drive to amuse me. I went with them, and Baroness (then Miss) Lehzen (my governess) in a pony carriage and 4, with 4 grey ponies (like my own), and was driven about the Park and taken to Sandpit Gate where the King had a Menagerie—with wapitis, gazelles, chamois, etc., etc. Then we went (I think the next day) to Virginia Water, and met the King in his phaeton in which he was driving the Duchess of Gloucester,—and he said ‘Pop her in,’ and I was lifted in and placed between him and Aunt Gloucester, who held me round the waist. (Mamma was much frightened.) I was greatly pleased, and remember that I looked with great respect at the scarlet liveries, etc. (the Royal Family had crimson and green liveries and only the King scarlet and blue in those days). We drove round the nicest part of Virginia Water and stopped at the Fishing Temple. Here there was a large barge and every one went on board and fished, while a band played in another! There were numbers of great people there, amongst whom was the last Duke of Dorset, then Master of the Horse. The King paid great attention to my Sister**, and some people fancied he might marry her!! She was very lovely then—about 18—and had charming manners, about which the King was extremely particular. I afterwards went with Baroness Lehzen and Lady Maria C. to the Page Whiting’s cottage. Whiting had been at one time in my father’s service. He lived where Mr Walsh now does (and where he died years ago), in the small cottage close by; and here I had some fruit and amused myself by cramming one of Whiting’s children, a little girl, with peaches. I came after dinner to hear the band play in the Conservatory, which is still standing, and which was lit up by coloured lamps—the King, Royal Family, etc., sitting in a corner of the large saloon, which still stands. On the second visit (I think) the following year, also in summer, there was a great encampment of tents (the same which were used at the Camp at Chobham in ’53, and some single ones at the Breakfasts at Buckingham Palace in ’68-9), and which were quite like a house, made into different compartments. It rained dreadfully on this occasion, I well remember. The King and party dined there, Prince and Princess Lieven, the Russian Ambassador and Ambassadress were there. 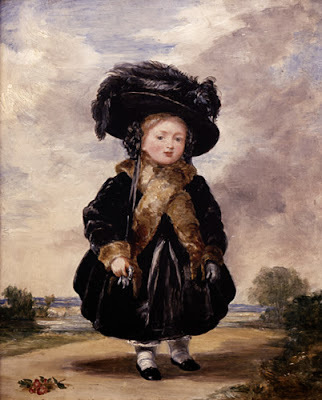 In 1826 (I think) my dear Grandmother, the Dowager Duchess of Saxe-Coburg-Saalfeld, came to Claremont, in the summer. Mamma and my sister went on part of the way to meet her, and Uncle Leopold I think had been to fetch her as far as Dover. I recollect the excitement and anxiety I was in, at this event,—going down the great flight of steps to meet her when she got out of the carriage, and hearing her say, when she sat down in her room, and fixed her fine clear blue eyes on her little grand-daughter whom she called in her letters ‘the flower of May,’ ‘Ein schönes Kind’—’a fine child.’ She was very clever and adored by her children but especially by her sons. She was a good deal bent and walked with a stick, and frequently with her hands on her back. Up to my 5th year I had been very much indulged by every one, and set pretty well all at defiance. Old Baroness de Späth, the devoted Lady of my Mother, my Nurse Mrs Brock, dear old Mrs Louis—all worshipped the poor little fatherless child whose future then was still very uncertain; my Uncle the Duke of Clarence’s poor little child being alive, and the Duchess of Clarence had one or two others later. At 5 years old, Miss Lehzen was placed about me, and though she was most kind, she was very firm and I had a proper respect for her. I was naturally very passionate, but always most contrite afterwards. I was taught from the first to beg my maid’s pardon for any naughtiness or rudeness towards her; a feeling I have ever retained, and think every one should own their fault in a kind way to any one, be he or she the lowest—if one has been rude to or injured them by word or deed, especially those below you. People will readily forget an insult or an injury when others own their fault, and express sorrow or regret at what they have done. ** The Princess Feodore of Leiningen, afterwards Princess of Hohenlohe, Queen Victoria’s half-sister.